This unique document is the first time the singles have been presented together and shows the band, not always associated with the single format, in an fascinating new way, from well loved tracks like “Halleluwah“, “Vitamin C“, “Spoon“, “Mushroom” and the UK top 40 hit “I Want More” to more obscure singles such as “Silent Night“, “Shikako Maru Ten” and “Turtles Have Short Legs“, many previously unavailable on vinyl outside of their original 7” release. Can, long acknowledged as an important influence on musicians across all genres, have been sampled and covered extensively. 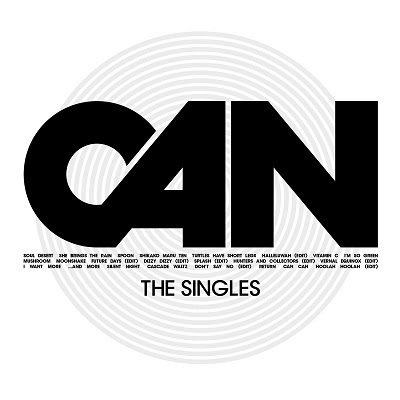 WhoSampled.com, in collaboration with Mute and Spoon Records, have put together The Story Of Can, illustrating the breadth of their incredible legacy through sampling, remixes and cover versions. Can, founded in 1967 released their debut album Monster Movie (1969) which set them apart from the mainstream, carving out a sound that transcended the boundaries of experimental electronic, jazz and modern classical music. Can’s influence extends from post-punk musicians such as Joy Division and Primal Scream, through avant-garde composers including Bernhard Lang, to Radiohead. Irmin Schmidt himself began his musical career as a pupil of Stockhausen and Ligeti, and conducted numerous high-profile orchestras in his native Germany and abroad. Hearing the sounds of Jimi Hendrix and Frank Zappa in the 60s led to the formation of Can but Schmidt never lost touch with his avant-garde classical upbringing, and it is to Schmidt that Can owed much of its musical eclecticism. CDB – 90s MASTERS OF AUSTRALIAN R&B – ‘TAILORED FOR NOW’ UPDATE + TOUR DATES!